Eli's enthusiasm after we said, "Eli, do you wanna potty train this weekend?" made us wonder if perhaps he thought we were asking him if he wanted a locomotive with potties on it. As he soon learned, that was not the case. When Eli woke up yesterday morning I exclaimed that a special potty surprise had come for him the night before. He was amped. It took zero convincing to get him to hop into his new undies. He loved them right away. It also took him zero convincing to drink a cup full of juice first thing in the morning. As Eli was checking out his new potty, he noticed the jar of Skittles in the bathroom and started begging. "Eli. You can have some candy if you use your potty." Eli ripped his underwear off and went a teensy tiny bit in his potty. He proudly stood up and shouted, "Now get candy!!" I glared at Eli for a minute because he's acted so clueless about how to have any control over his bladder. Now with candy into the mix he's suddenly a pro? Eli's first-thing-in-the-morning success made me confident my boy is ready to ditch the diapers. Our first huge accident quickly came after our first success. Luckily it was all over the kitchen floor and luckily Eli did not like the feeling of getting wet. Five accidents later he realized the cause and effect of wetting his underwear and he started to hold all that digested Gatorade in. Right before nap time as I was feeling very discouraged with only two minor successes and five accidents, Eli started saying, "Ouch. Ouch. Ouch." I couldn't figure out what was hurting him. "Eli? What's wrong bud?" He continued his "Ouching" while slowly inching towards the bathroom. *Gasp* "Eli! I think what you're feeling is that you need to use the potty. Let's go sit on the potty." After reading three books on the potty, Eli finally mustered up the courage to go for the first real time all day. We were both really proud. Post nap he had two tiny accidents and three successes. He might just be getting the hang of this! I was so excited for the funny blog posts I was sure would come from potty training but it's actually gone much smoother than I ever expected. I've been following the advice from this blog on how to potty train a 2-year old and it's worked really well for Eli. Onto day two. I think we can. I think we can. I think we can. What an awesome student! He's a quick learner! Sounds like potty training at your house is going to be a breeze! 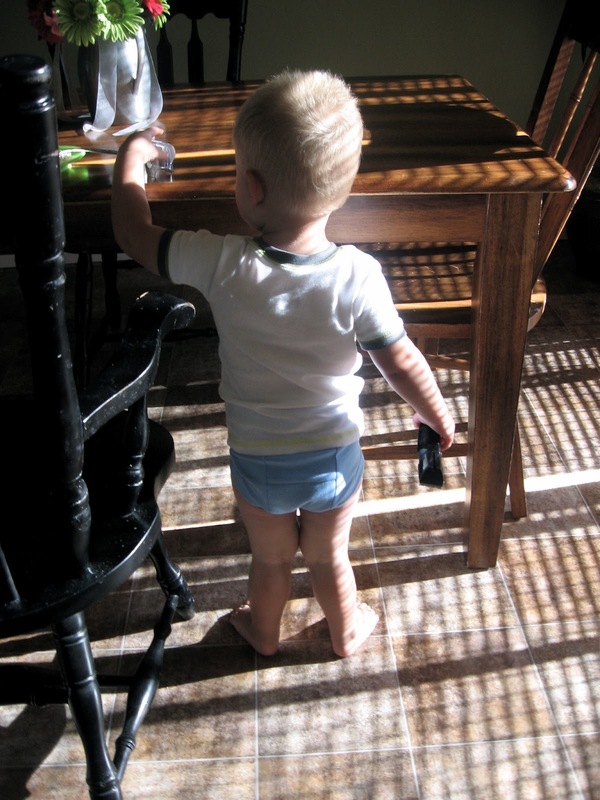 I like the blog lady who thinks potty training at 2 is the way to go. Her tips are great. Keep up the good work Sarah, Jeff and Eli! I know you can. I know you can. I know you can. Oh my! I hope it really is as easy as this and Eli keeps up the good work! Oh, and I love that the grand prize is a trip to DI. You use cloth diapers? Gross! Sarah this post made me laugh so much. Thanks for making me smile today! I love Eli stories! So good! Way to go Eli/Sarah/Jeff...and even Carson who I'm sure supplies moral support.